Fall and early winter are my favorite times of the year. 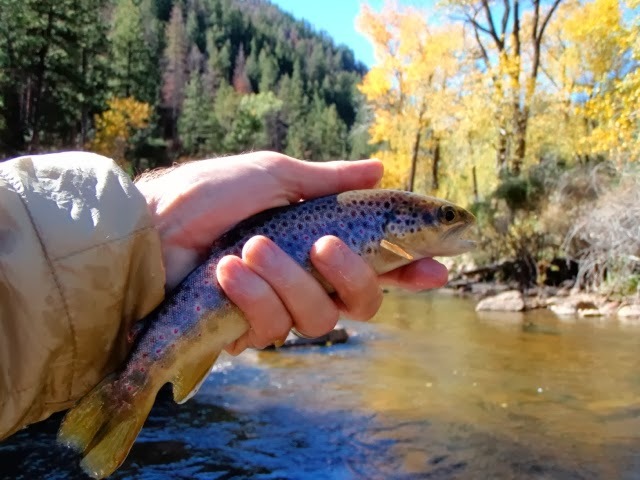 The cool days, bright leaves, and best dry fly fishing of the year combine for great times in the Colorado mountains. A couple weeks ago I took the time to head up the Poudre Canyon for a couple of hours of flyfishing. This was my first trip up the canyon since the devastating flood in September. 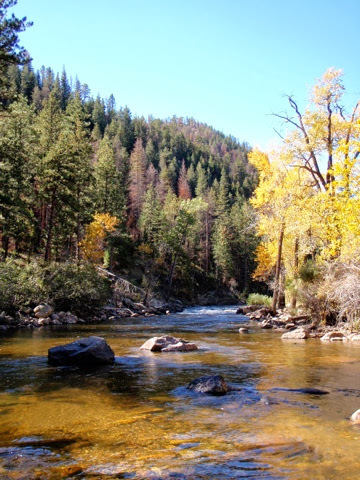 The Poudre River, which usually runs around 150 CFS, was well over 10,000 CFS. 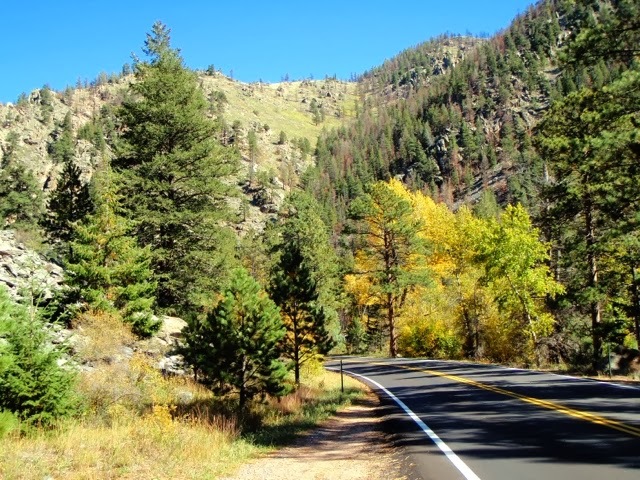 The Poudre Canyon is more rustic, and less built up then the Big Thompson Canyon to our south, and thus received less damage to the roadway, and residences. After a few repairs, the road up the canyon was opened, and I was anxious to see what the status of my favorite river was. This river has taken a lot from Mother Nature in the past couple of years...a major fire which left soot and debris in the river, and now the flood. I was amazed at what I found when I made the drive up the familar road. The river level was down, and appeared close to normal for this time of year. The water was crystal clear, and it seemed as though the massive flood water had scrubbed the riverbed clean. The piles of soot which formerly lined the banks was gone, and the river seemed like it had been reborn. The fall color seemed to be in it's peak, and I greatly enjoyed the drive. I decided to stop at a new spot in the river that I had not fished before, geared up, and entered the cold, clear water. 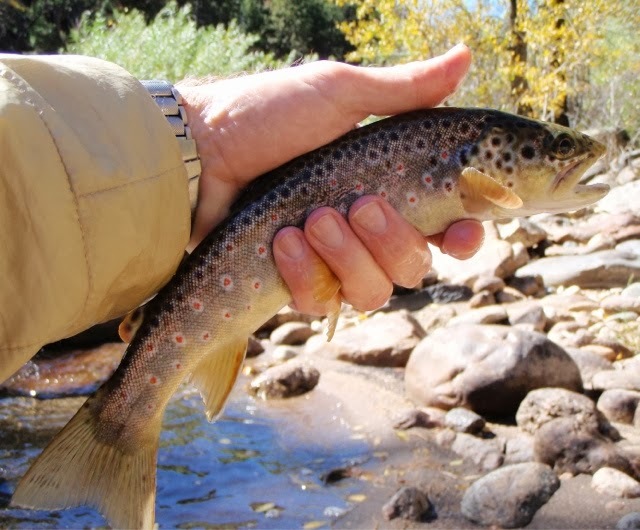 I caught a couple of bright fall browns, and marveled at their survival from the recent tempest. Although the floods caused a terrible loss of property and life, at the end of the day, nature rebuilds itself. We had prepared ourselves for several years of poor fishing in the lower canyon due to the constant wash of soot and ash...but now it seems even more pristine then before the fire. Make sure you get out and experience fall where you live...and take a moment to enjoy the splendor. Hey Mike, that's the best news I've heard in a long time. The last time I visited the canyon it was heartbreaking. Thanks for posting a positive report. Well written Mike! Nic pics as always and you definitely captured the beauty that is the canyon. Glad you were able to see the canyon dressed in its fall colors! Hope to get up there with ya soon!